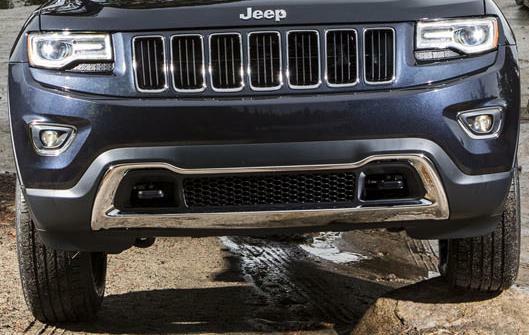 This genuine Mopar factory chromed bumper insert is original equipment on the 2014-2016 Grand Cherokee WK2 Limited and Overland Editions and can be used to replace the black textured piece on the Laredo, to add a little more glow to the front of your Jeep. It does not fit the SRT8, Summit, High Altitude or 75th Anniversary models. Tow hooks and the black honeycomb inserts are not included. 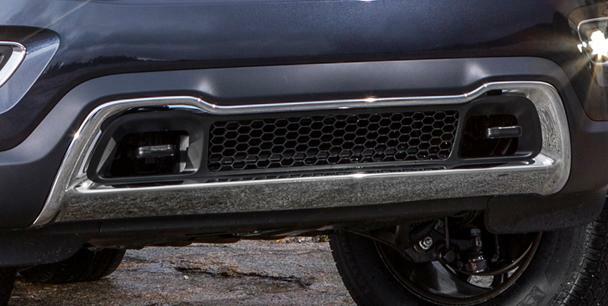 Because installation of the chrome bumper insert requires removal of the front bumper cover, JustforJeeps.com recommends you have the part installed by your Jeep dealer or a qualified body shop. Will not fit the Summit, High Altitude, SRT8 or 75th Anniversary bumper covers. Does not include Tow Hooks or black honeycomb inserts. There are no installation instructions for this part. We recommend having this installed by a Jeep dealer or qualified auto body shop since it will require you to remove the front bumper cover from the Jeep to install. The bumper insert was absolutely perfect. It was quite easy to install. I had this professionally installed, as recommended by JustforJeeps, and after it was put on I couldn't believe how much better it made my Jeep look. Not only does it look great, the price is very good as well. Really made all the difference on our new 2014 Grand! The chrome insert on our white Jeep added just the touch of class we were looking for, without overdoing it. Thanks for all your help with your email response - great company - our new 'go to' Jeep place.